Sometimes a film transforms itself into something else right before your eyes. Ten years ago, after a particularly difficult day caring for my infant daughter, I went out at night to unwind with a movie. My judgment was clearly impaired, as Revolutionary Road was not exactly a flick to relax with. But I felt for anxious Kate Winslet, a Rosemary stuck in suburbia with her babies. Once I made that association, I saw everything in a different, macabre light—that the very house she lived in was feeding on her, sapping her soul, as in Burnt Offerings (1976) and other thrillers; that Leonardo DiCaprio, her ladder-climbing, neglectful, cheating husband, was a Jekyll and Hyde type; and, especially, that their emotionally disturbed neighbor (Michael Shannon) was a Frankenstein monster, whose unbalanced truth-telling seals their fate. I duly reported this phenomenon online, where I was gratified to find that others had similar experiences, of strange echoes pinging through movies never intended to generate them. I fully expected Ben Is Back to be another somnolent drama about teenage drug addiction, in the manner of Beautiful Boy, which preceded it into theaters last fall. But that film was based on father-and-son books about their experience; unbound by autobiography, writer/director Peter Hedges goes in a different direction, one that again intersected with my cinephile past. Ben (sensitively, nervously played by Hedges’s son, Lucas) is back, and mother Holly (Julia Roberts) is pleased to see him. But Ben, a painkiller addict since a skateboarding accident in high school, is back from rehab, and his family is mostly wary of a son who is, but isn’t, the one they knew. Feeling like a suspect in his own home (it’s Christmas Eve, and everyone is struggling to maintain a false front of seasonal cheer), Ben goes mall shopping with his mother, but the ghosts of his recent reckless past come back to haunt them. The elements were familiar—a small town, familiar on the outside, suddenly rendered alien and hostile; a panicked flight through a secretive underworld whose inhabitants have succumbed to a force they can’t shake; a frantic race to rescue a loved one from a death sleep. First, the source material. It’s still a great read—Our Town with monsters. But Finney didn’t like the pods (“The best I could do,” he commented) and no one liked his optimistic ending, in which the protagonist, Dr. Miles Bennell, pretty much shoos the creatures back to outer space, to find a less resistant planet to overcome. (Seeing that we were wasting our natural resources, the aliens thought they could come to Earth, take us over, and waste our resources themselves, leaving our big blue marble a husk before moving on.) Finney was about the only person who liked the title, which the first cadre of adaptors found silly and exploitative (and too reminiscent of Val Lewton’s 1945 production The Body Snatcher, which was then in rerelease), but no one could think of anything better. 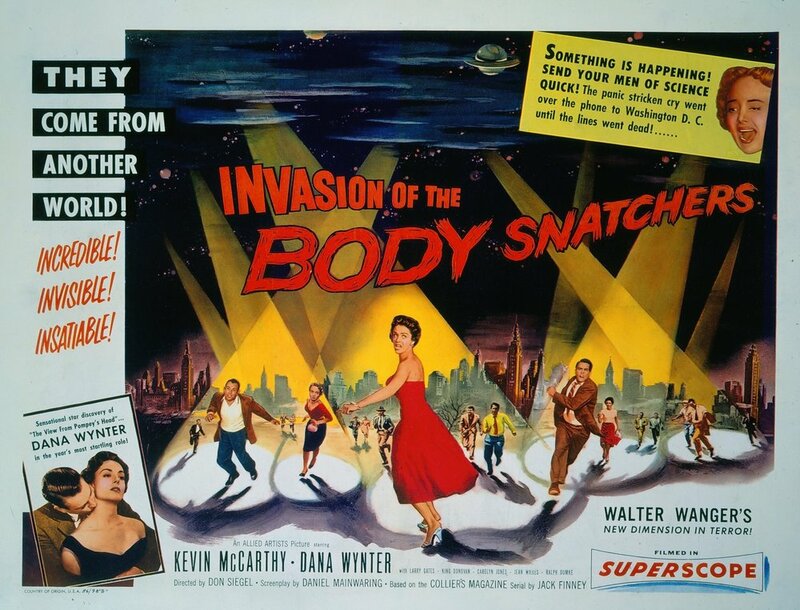 “How could I take my mother and father to see something called Invasion of the Body Snatchers?,” recalls co-star Dana Wynter in a colorful commentary track she shares with the first Bennell, Kevin McCarthy, and genre director Joe Dante. Distributor Allied Artists, which ordered revisions to Siegel’s original, more dystopian cut, had the same feeling, and premiered it not in glamorous Manhattan but lumpen Brooklyn. From there it was dumped into the lower halves of double bills, then onto TV, where it seeded the imaginations of budding filmmakers such as Dante, John Landis, Larry Cohen, and Stuart Gordon, all of whom attest on the disc to its hardboiled brilliance and continuing influence. “A genre picture for grownups” is how the film is described on Olive’s Signature Edition Blu-ray, which is accurate, if unfair to the likes of The Day the Earth Stood Still (1951), Them! (1954), The Incredible Shrinking Man (1957), and the alien control movies that preceded it in 1953, Invaders from Mars and It Came from Outer Space. But none of them burrowed under the skin quite like Invasion of the Body Snatchers. Like pimples, the pods erupted across the fresh, clean face of Eisenhower-era America, disturbing its well-ordered façade. Miles Bennell (Kevin McCarthy) examines a pod in the original 1956 film.